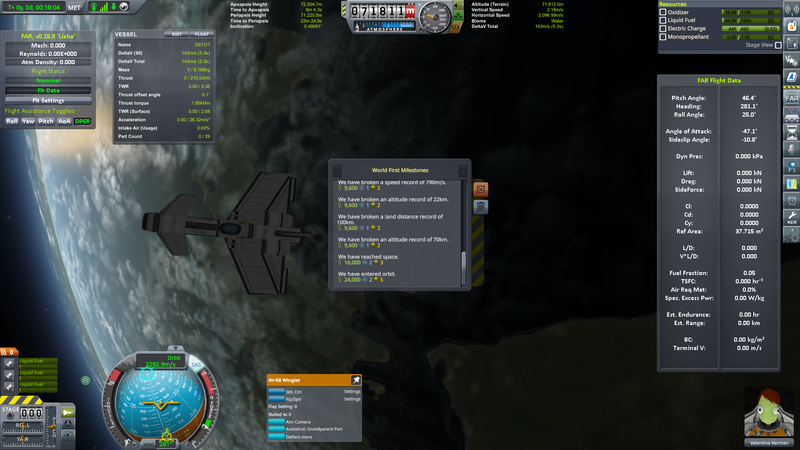 A low tech single stage to orbit aircraft for Andetch’s Caveman Tech SSTO Challenge. Built for Ferram Aerospace Research. Has no action groups aside from default Gear and Brake groups. You’ll need to bring up the info window for the front flaps to use them, but the flaps do work. Be careful though, as those flaps are powerful in the lower atmosphere. The craft can just reach orbit with 100+ m/s to spare. No parachutes! Use the J-33 Wheesley’s Reverse Thrust capability and flaps to touch down at a safe speed. You’ll also need to reverse the flaps (set to -15) as it’ll want to pitch up as you approach the runway.